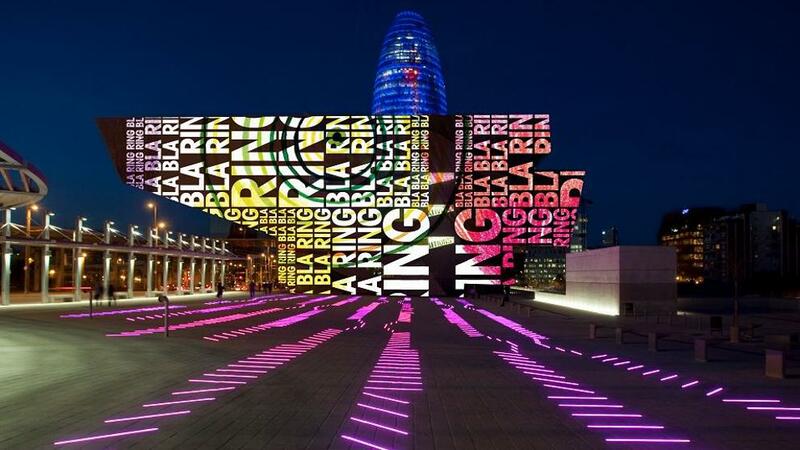 This February, the neighbourhood of Poblenou played host to the Llum Festival – Barcelona’s festival of light, for the first time. In its seventh iteration, the festival doubled in size from the previous year, and offered 40 different installations and exhibitions, from local students of art, design, lighting and architecture, as well as acclaimed international artists. Culture vultures that we are, a night-time jaunt through Poblenou was a must. With darkness falling over the district, the boulevards and backstreets teemed with people. Onlookers young and old stood in awe as the streets, so familiar to many there, had transformed into canvasses for illuminated works of art. As well as providing an opportunity for a family-friendly evening excursion, Llum showcased the potential of traditional urban and commercial environments, which so often fall victim to the monotony of our daily routines, to be reimagined as vibrant, invigorating spaces. The choice of Poblenou as the setting for Llum is in line with the economic, social and cultural development the area has witnessed since the turn of the century. In 2000, the 22@ project sought to decentralise some of the densely concentrated energy which stifled the city center and breathe new life into the tired, industrial fabric of the outskirts. Since then, through progressive policy changes and collaborative development plans, the district has grown, both in terms of business, innovation and the number of people living there. All in all, Llum was lit. From a personal perspective, I was amazed by the capacity of artists, local authorities and sponsors to collaborate and implement such a transformative project on such a large scale – literally taking over an entire neighbourhood for three days. A number of installations were even fabricated by students of local universities. I was also heartened to see, as I have many times before in Spain, an environment created which catered to young and old, families and individuals, and which went on into the night without a hitch. In my opinion, it was an event which other cities, like my native Dublin, can learn from.